There are 9 reviews of Royall Rugby. Reminds me of Terre D'Hermes by Hermes and Yardley's Citrus & Wood. Oviatt, you are exactly right! This reminds me almost EXACTLY of Yardley Citrus & Woods, so much so that I even wonder if it was repackaged! Very nice frag for the price and perfect for spring! I applied some in a store, and I forgot what it was. But I kept going back to it on my arm. I had a few others in a couple of different places, but this one stood out. When I returned later and bought it, I felt it was too strong. I guess the good thing is that a little goes a long way, and it smells fresh and complex. But it does not have that clean, aquatic soapy kind of freshness like most newer scents. Instead, it has a rather deep & green, woody scent. It's kind of preppy, and I think aptly named. Very sharp and fresh and green. This reminds me strongly of Yardley's Citrus & Woods and even of Terre d'Hermes. The black currant note is a nice opening and not at all Ribena-like. This leads into the geranium note that has the green snap of freshly trampled grass, with earthy patchouli and Vetiver bringing up the rear. Very modern smelling for this very traditional house and a great addition to their line up of classics like Lyme and Bay Rhum. This is a fresh daytime scent that is perfect for the office and casual wear--a weekend visit to the pub would be the perfect setting for this. Masculine and sporty, this is an apt tribute to the game of Rugby and a nice alternative when something fresh yet deep is required. I have been a big fan of this scent for a while, having sampled it on multiple occasions. I finally broke down and bought a bottle, and I couldnt be happier. 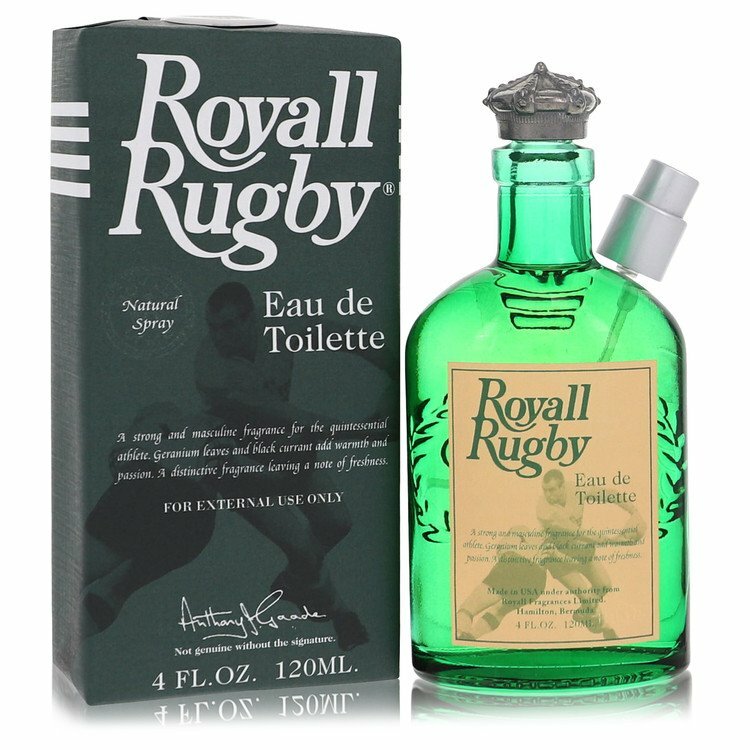 Rugby provides a balanced classic scent which reminds you of England. I happen to be a rugby player, and this makes you think of the field, the slight stain from wet grass, and the best part the english leather of rugby balls or a leather helmet. It is definitely a spring time scent, but it succeeds in providing a calming scent that is still masculine. I would agree with some of the other reviews that Royall Lyme of Bermuda seems to struggle a bit with creating a scent with the greatest longevity, but this is definitely a scent that will stay stocked on my shelf for a long time. "A fragrance as unique as the game itself" -- Royall had it right, there. It carries a pleasant and spicy pine scent upon initially applying the fragrance, but it soon fades into smells of wood, grass, flesh, sweat, leather and such. It could just be my body's chemistry throwing it off, but it reminds me of the sense I get upon being socked in the jaw, which might be what Royall was after. I don't really enjoy thinking of that all day long. I imagine it might be better when paired with Brut or something. But for a single fragrance, I would buy a generic attempted emulation of Brut found in the dollar store over this one. Bottom line: what a disappointment from Royall. Get Royall Spyce or Lyme instead. There are no member images of Royall Rugby yet. Why not be the first?